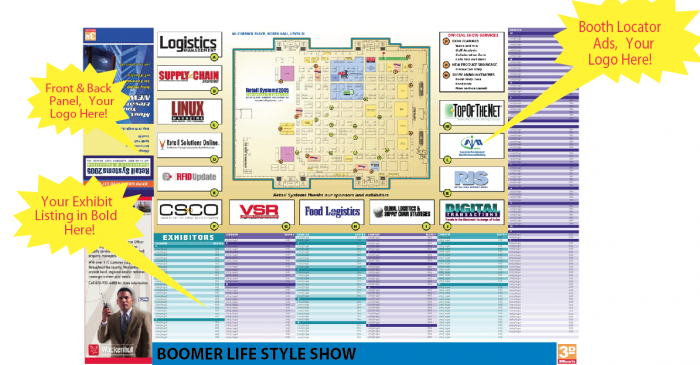 Show Navigation Map - Who-what-where-when; a pocket map of your expo floor activities, partner booths and event host city sites, at your attendee’s fingertips. Help your guests navigate the show, highlight official expo floor features, find exhibitors with an alpha listing, find scheduled classes, host hotels and bus routes. Hand Delivered - Expo Map is a perfect advertising vehicle for your corporate partners. Advertising opportunities include front and back panel, internal advertisements, and highlighted exhibitor listings. Complete Map Customization - 3D Expo Map design is completely customizable to reflect your event branding and design. This includes front and back panels, expo floor layout, listing of exhibitors and booth numbers, 6-18 advertising panels, highlighted official expo floor show features and complete conference schedule. Additional customization can include the city map and host city tourist attractions, expo hotels and marked expo transportation routes.